What is Dataiku DSS ? 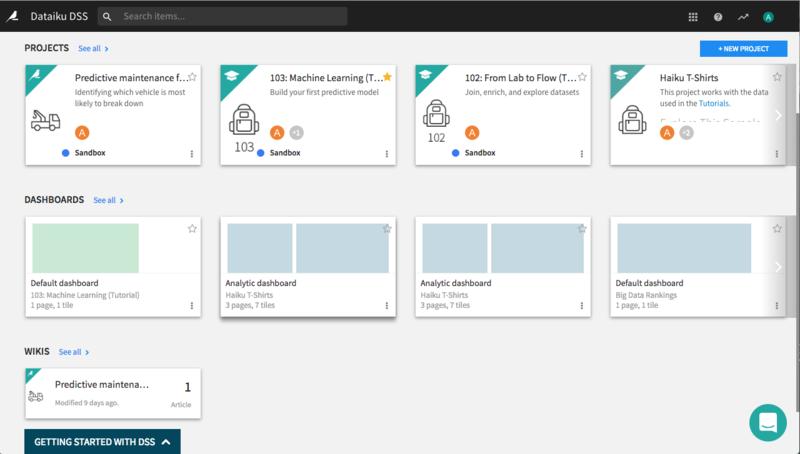 Dataiku DSS is a data science software that was purposely made to assist engineers, analysts, and scientists generate, explore, and deliver data products effectively. Dataiku DSS is a systemized data science and analytics program that contains a visual interface and integrated coding. It promotes that use of popular notebooks like Spark, Hive, Python, and R. The drag-and-drop interface can be utilized anywhere within the dataflow prototype process whether it’s from wrangling to analysis to modeling. Dataiku DSS’ offers data integration to more than 30 connectors and has customized plugin extensions that link users to their current system. The tool can also detect schema and data formats and promotes computation to Spark, Hadoop, and SQL systems. A clear profile of each organization’s information at every area of analysis helps users to search, prepare, collate, and clean data effectively. The software also takes advantage of current Machine Learning tools like XGboost, XGboost, and Scikit-Learn. The platform has tools and a UI that can help generate and upgrade models within R or Python for quick feedback on model performance. Its Production Deployment solutions cover the whole workflow. Meanwhile, its Monitoring and Version Control will make sure deployments are carried out with the right data validation policies. With Dataiku DSS, users can explore, generate, and do preparations without dealing with storage, access, and format issues. The software has over 25 connectors. Users are given the option to come up with one their own. Users can freely have access to data anytime and anywhere. They can directly access data regardless of data size and/or current structure setup. Dataiku DSS has a Quick Columns View that lets inspect the quality of their data in real-time. It spots data duplicates and invalids while ensuring the precision and completeness of current data. Summaries of statistics can be accessed with a single mouse click. The software offers preparation tools to ensure dependable, swift, and advanced predictive and analytics modeling. The tool has a spreadsheet-like setup as well as auto-suggestive transformations, which allows for improved performance on mass actions. Dataiku DSS boasts over 90 pre-installed visual processors that facilitate in filtering, searching, and running code-free wrangling. Users are given the freedom to make solution customizations using self-tailored transformation and business-specific types. Python scripts and Formulas scripts allow for customized processing. The tool offers a dashboard that makes it simple for users to generate visualizations and interactive charts from their datasets. The dashboard consists of more than 20 pre-installed chart formats while allowing drag-and-drop data to compute charges automatically on today’s Big Data Infrastructure, which significantly improves performance.